Indoor air quality has a significant impact on human health, especially for people who spend a large portion of time each day in their homes. Increasing the oxygen levels of home air can help you feel more alert and aid in avoiding headaches and respiratory ailments. Add oxygen to your home air in natural ways to reap the benefits of increased oxygen levels. 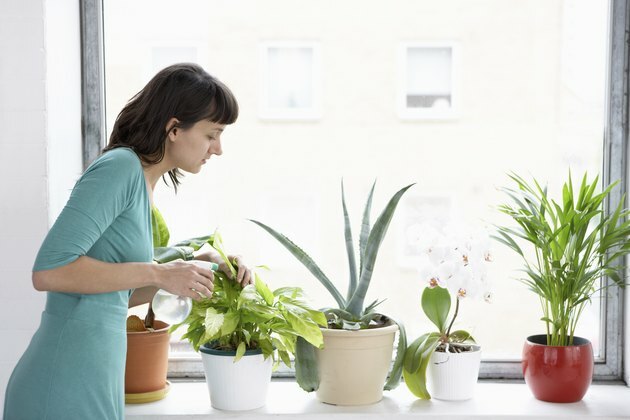 Houseplants add oxygen and moisture to indoor air, as well as removing pollutants such as volatile organic compounds released by carpeting and building materials, advises Home Depot. Tropical plants, like peace lilies, bamboo palms, Dracaenas, golden pathos and spider plants are particularly well suited to cleaning and oxygenating home air as they are accustomed to growing efficiently in low-light environments. Use 15 or more plants for a home of less than 2000 square feet, Home Depot suggests. Dr. B.C. Wolverton of Wolverton Environmental Sciences, Inc., an indoor air quality consulting firm, particularly recommends growing succulents, orchids, and bromeliads, as well as the Sanseviera or snake plant, as these continue to give off oxygen at night as well as during daylight hours. The simplest way to enhance oxygen levels in the home may be to open a window or install an air-exchange vent. When a home is inadequately ventilated, in-home fuel-burning heaters, such as oil burners, wood stoves, fireplaces, or gas heat, may lack sufficient oxygen for efficient and complete fuel combustion. In this case, the fuel-burning heater will rob oxygen from the air in the home to burn, according to the Minnesota Blue Flame Gas Association, a non-profit organization which educates consumers about natural gas heat and appliances. Increasing air flow into the home by opening a window near the heater, or installing a vent to get air where it's needed for fuel combustion, will enhance winter oxygen levels in the home. Trees generate significant amounts of oxygen as well as removing carbon dioxide and pollutants from the air. Planting trees around your home will not only add oxygen to the air coming in to the house through open windows and vents, but can reduce the amount of time you need to run heaters and air conditions which can remove oxygen from home air. Over a 50 year lifespan, each tree generates over $31,250 worth of oxygen, according to Tree Folks, a non-profit organization dedicated to enhancing the urban forest resource of central Texas. That oxygen is available free to homeowners who plant trees around their home—and the trees will also enhance the resale value and attractiveness of the home.